Oro Valley - parking lot located at the northwest corner of First and Oracle (near Starbucks). Attendees traveling from outside the Tucson area can join the group at the main Christmas gate at 8:30 AM. The AGS is grateful to Freeport-McMoRan for covering the costs for the guidebooks and the lunches. The proceeds from this event will be donated to the AGS Scholarship Fund. Once the limit of 40 has been reached, you can be placed on a backup list by contacting the AGS Secretary at secretary@arizonageologicalsoc.org. Tour Description: AGS Members and their guests are invited to visit Freeport-McMoRan’s Christmas porphyry copper deposit in Gila County, Arizona. The Christmas deposit (and former Christmas Mine and abandoned townsite) are situated at the southeastern end of the Dripping Springs Mountains. 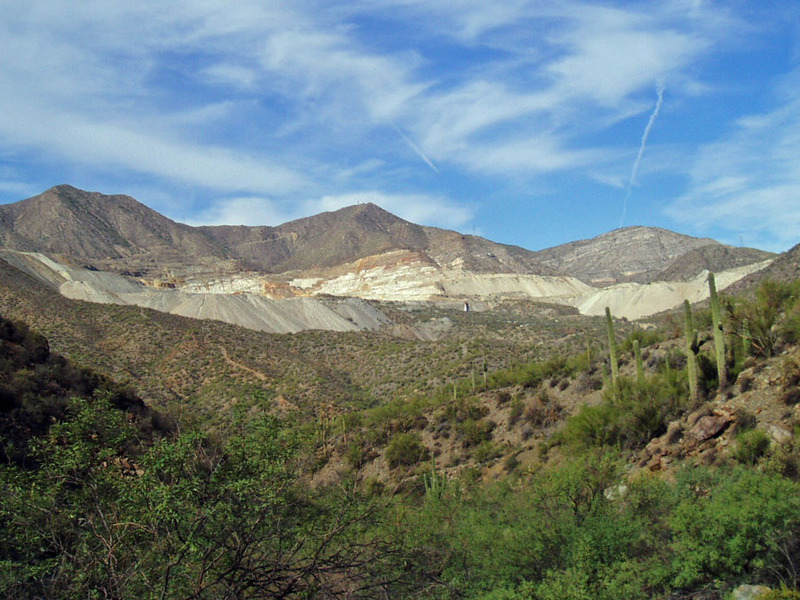 The deposit is one of the last largely undeveloped deposits remaining in the prolific porphyry copper province of southeastern Arizona. The tour will include an examination of core and stops at significant geologic outcrops in the vicinity of the closed mine. Tour Date/Time: Sat. April 26, 2014. The on-site tour will last from 8:30 AM to approximately 3:30 PM. Carpool Locations: Parking space at the site is limited so carpooling is encouraged. Attendees will assemble at 6:30 AM in Oro Valley at the parking lot located at the northwest corner of First and Oracle (east of the Starbucks). (Note: please park in the outer areas, not immediately adjacent to Starbucks) We will leave parking lot promptly at 7:00 AM. Carpool locations will be established from Phoenix area once participant interest is known. A participant contact information will be sent to the participants in advance so carpool arrangements can be made prior to the trip. Route: The group will travel north from Oro Valley, along Highway 79, through Oracle Junction and then northeast along Highway 77 (driving past the turnoff to Winkelman and Hayden) to approximately mile marker 147, the main Christmas Mine gate. The gate is on the west side of Highway 77. The approximate travel time is 1.5 hrs. Attendees traveling from outside the Tucson area can join the group at the main Christmas gate at 8:30 AM. Conditions & Recommendations: All attendees must have basic personal protection equipment including hard hats, steel-toe boots, reflective vests, and eye protection. Long pant and long-sleeve shirts recommended for protection from the sun and vegetation. The roads at the mine site are passable, but not great, so drivers should be aware of the rough dirt roads. Lunch: Details to be provided closer to the trip date. Bring your own snacks and water. Guidebook: FMI has graciously agreed to provide a free guidebook to trip participants. One copy is recommended to be shared among couples or family members. The guidebook will summarize the geologic relationships at the deposit. Additional guidebooks will be produced by AGS following the trip for sale at the dinner meetings. Group size: Limit 60: Preference will be given to AGS members. A backup list will be maintained in case of cancellations. Please let us know in advance if you need to cancel in order to allow others to participate from the backup list. Once the limit of 60 has been reached, you can be placed on a backup list by contacting the AGS Secretary at secretary@arizonageologicalsoc.org. Registration Fee: A $20 donation per person to support the AGS Scholarship Fund is requested by secure online credit payment or cash/check. There will be no fee to Student Members. Contact: AGS VP Field Trips Ralph Stegen at rjstegen@gmail.com or (520) 498-6811 with any additional questions.